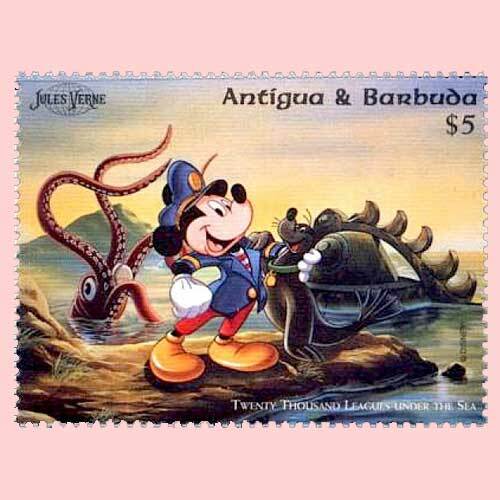 In a first, Antigua and Barbuda issued stamps that fused the worlds of Disney and those created by Jules Verne! Issued on 6th June 1996, these set of 12 stamps depicts Disney characters exploring Jules Verne’s world. The stamp shown beside depicts Mickey Mouse cavorting in "Twenty Thousand Leagues Under The Sea". "Twenty Thousand Leagues Under the Seas: A Tour of the Underwater World" is a classic science fiction adventure novel by French writer Jules Verne published in 1870. It is regarded as one of the premiere adventure novels and one of Verne's greatest works, along with Around the World in Eighty Days and Journey to the Centre of the Earth. The description of Nemo's ship, the Nautilus, was considered ahead of its time, as it accurately describes features on submarines, which at the time were very primitive vessels. Two souvenir sheets showing Mickey and friends in Jules Verne stories also were issued. We will see each one of them in the upcoming series.